Mr. Calderone is a founding principal of HCP, and a lead trial attorney in HCP’s product, construction, municipal, and general litigation group. Since 1990, he has successfully counseled and defended both public and private clients in product liability, industrial accident, personal injury, employment, construction litigation, professional liability (architects, engineers, and accountants), commercial litigation, insurance coverage, and insurance defense litigation. Mr. Calderone has argued cases at the state, trial, appellate, and Supreme Court levels, as well as federal courts throughout the country. 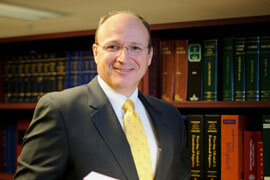 Law & Politics Magazine selected Mr. Calderone as an Ohio Super Lawyer. Corporate Counsel Magazine, Cincinnati Magazine and Akron Life & Leisure Magazine selected Mr. Calderone as one of Ohio’s Top Lawyers. Mr. Calderone was selected by his peers to be included in The Best Lawyers in America, and also to serve on the Litigation Council of the Ohio State Bar Association. Mr. Calderone served as lead defense counsel in a Medina County Fair explosion case which involved five fatalities and over 50 serious bodily injuries. Under the scrutiny of national media attention and facing some of Ohio’s premier attorneys, Mr. Calderone mastered early 1900’s steam engine technology and guided the client to a favorable result. Mr. Calderone literally traveled to the North Slope tundra of Alaska to defend a client in one of its largest and most complex lawsuits. As lead counsel, Mr. Calderone organized data from over 150,000 pages of documents and coordinated the strategy involving over 34 experts and 81 lay witness depositions. Mr. Calderone mastered tire design and construction, rim/wheel design and construction, and oil drilling rig design and construction to guide the client to a favorable outcome. Mr. Calderone served as lead counsel in a Ninety Million Dollar ($90,000,000.00) product liability case in San Francisco, California. The case involved an alleged defect in the outer shell, curtain wall system of a 35-story building. After an eight week trial against premier attorneys from several states, Mr. Calderone guided his client to a favorable result while four other defending parties were collectively responsible to pay an undisclosed eight digit figure to the plaintiff. Local media attention is often an issue when defending employment claims like sexual harassment, discrimination, and police misconduct. Mr. Calderone defends public and private entities against employment claims and is experienced at neutralizing public sentiment and rehabilitating public perception of his clients. Mr. Calderone has spoken at seminars regarding tire litigation, products liability, and Ohio personal injury law, and made presentations to various trade groups and associations. He is a former member of the Akron Bar Association’s judicial review committee, and a present member of the products liability and insurance defense committee of the Defense Research Institute. Mr. Calderone is a leader in the Copley-Fairlawn community. He was recently re-elected to a fifth term as a Member/President of the Copley-Fairlawn Board of Education. Mr. Calderone is passionate about working with young children and families in the Copley-Fairlawn community. He remains an active member within the Copley Amateur Athletic Association, and serves as the youth group coordinator for other community organizations. Mr. Calderone also served as the Board of Trustees President for the E.T.C. School of Musical Arts.